Bora Bora is the kind of destination I always dreamed of visiting, but never thought I would actually get to. The truth is that you needn’t spend a fortune to visit this once exclusive corner of the earth. 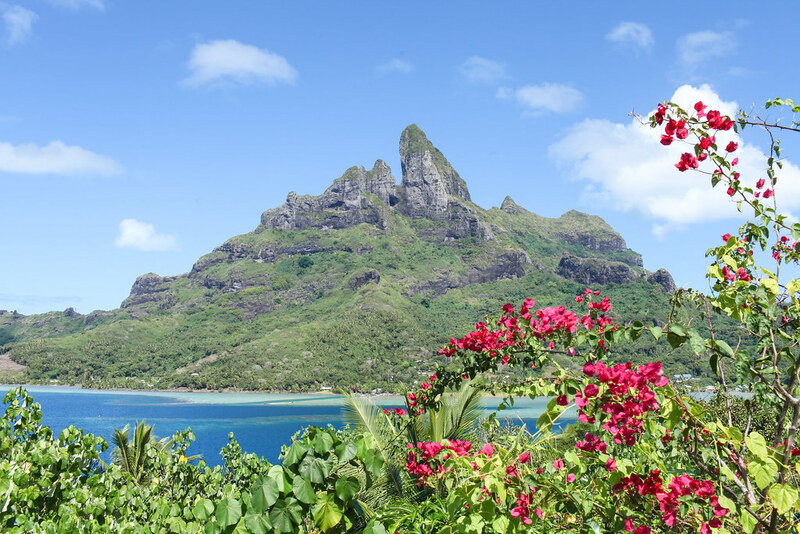 Sure, there are hundreds of honeymooners and overwater bungalows, but if you opt to stay on the main island of Bora Bora you’ll spend a fraction of the money and have an equally incredible time. I spent five nights on this idyllic island, which was the perfect amount of time to squeeze in all the underwater and on land activities. Here is a guide with the top sights and activities you cannot miss. This is hands down the most beautiful and most dangerous hike I’ve ever done. It’s not so much of a hike as rock climbing up a mountain hauling yourself up with hairy ropes and upper arm strength, but the view at the top is so worth it. 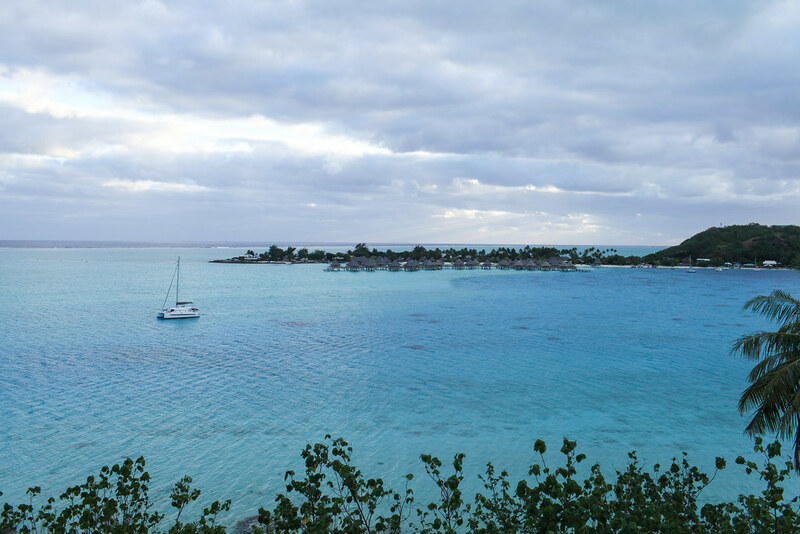 You get a 360-degree of the lagoon which you will never tire of. We stayed at the top for over an hour because we couldn’t tear our eyes away from the breathtaking lagoon where every shade of blue glistens under the sun. 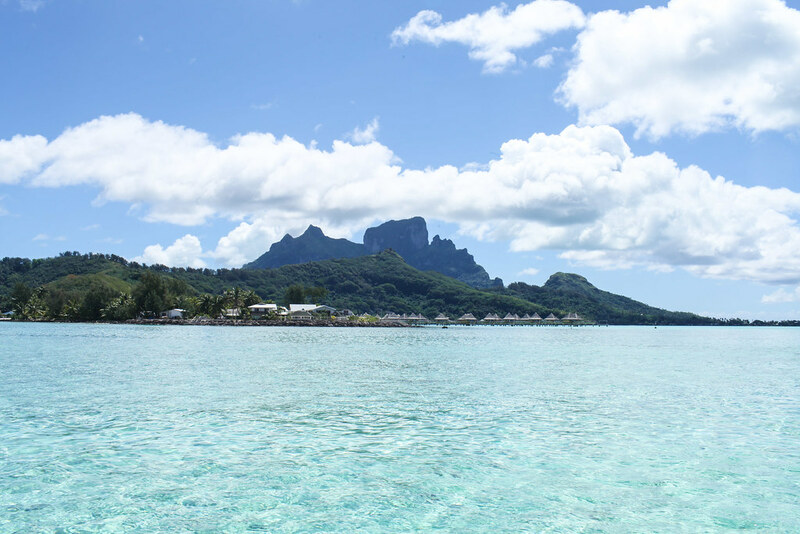 If there is one activity you simply have to do in Bora Bora it’s a boat trip around the lagoon where you’ll sail around the whole island, swim with sharks, stingrays and colourful coral gardens. After your underwater adventures you’ll be taken to a private island for a Tahitian feast cooked in a traditional oven underground made from volcanic rock and bread fruit leaves. It might be worth mentioning that this was the best food I ate throughout the whole of French Polynesia. 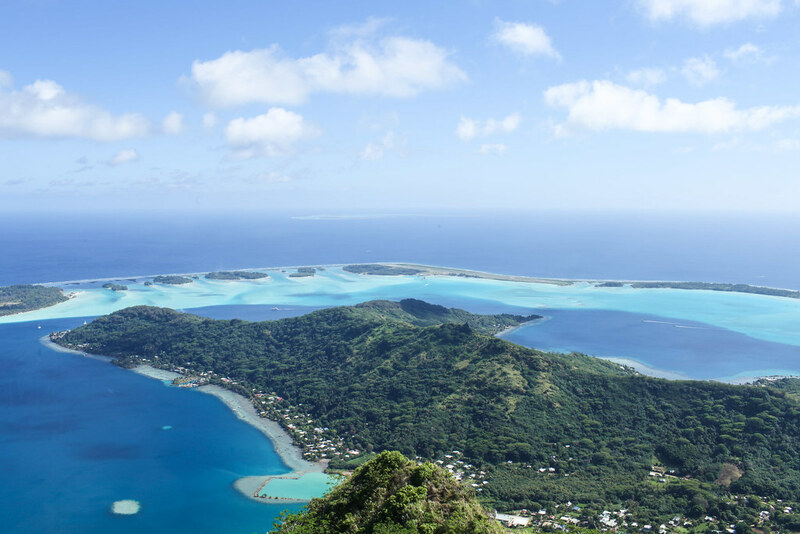 Bora Bora is synonymous with luxury hotels and overwater bungalows so treat yourself to an experience you’ll never forget and spend an evening dining on one of the private islands. Even if you can’t afford the hefty price tag of an overnight stay, you can still access many of the private islands as an outside guest. Taking the boat across the lagoon to your dinner venue is quite special, especially if you time it with sunset. Never in my life have I seen a beach with so many shades of blue. The colours range from gin-clear to aquamarine to deep turquoise and every shade in between. 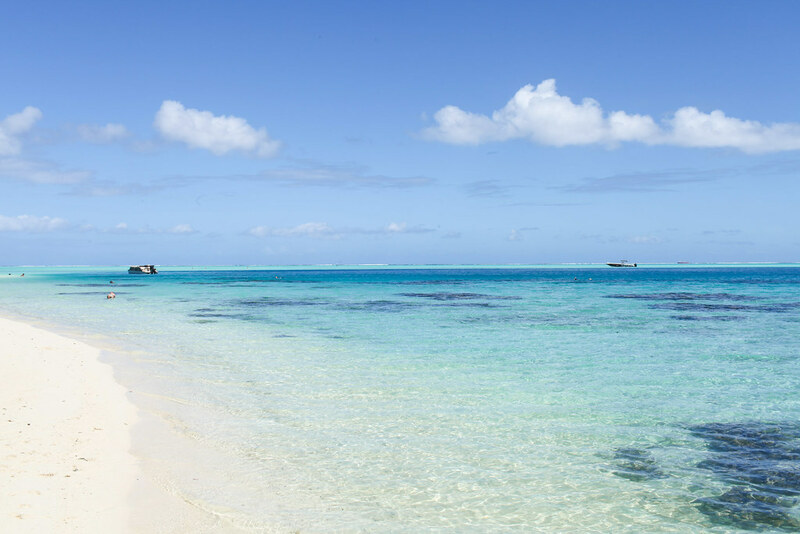 Walk the whole stretch of the beach before finding your favourite spot to lay down your towel and sunbathe. The beach is never very busy so you’ll probably have a stretch of sand all to yourself. Whilst the military cannons are the attraction here, I found the view to be much more impressive. Located directly opposite the Four Seasons, you’ll get an incredible view of the water bungalows and the beautiful lagoon from the cannons. The path takes you to a tip of the island and offers panoramic views along the route. This isn’t so much of a lookout as someone’s drive, but it’s worth the detour as the view is pretty incredible. 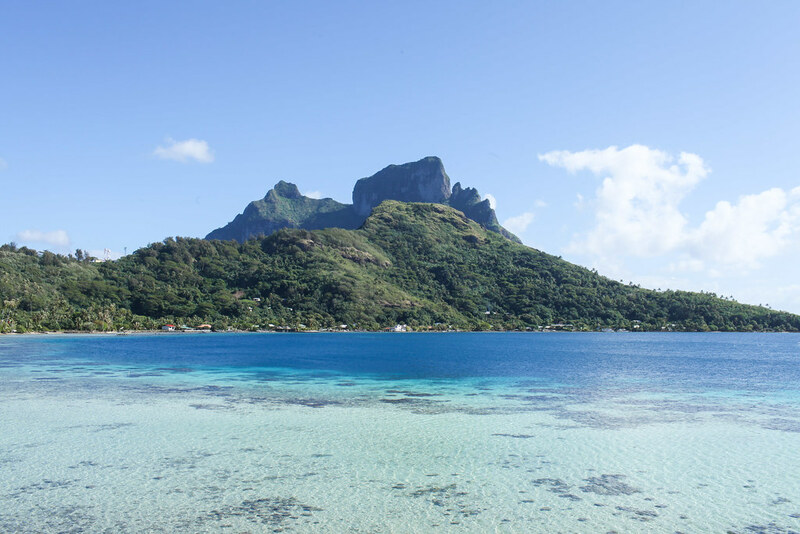 You’ll drive along a dirt track and reach a stunning, little beach with Bora Bora’s mountains in the distance. As far as I’m aware it’s open to the public as we didn’t pass any Private Property signs. 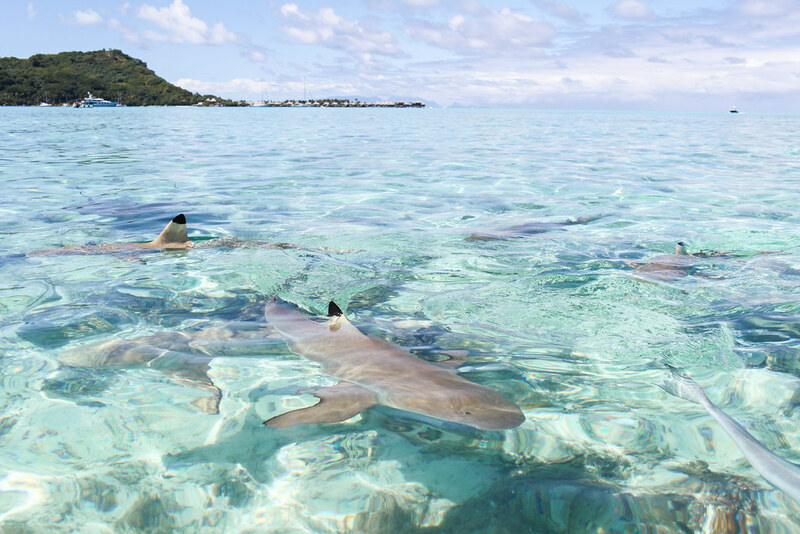 Swimming with stingrays in Bora Bora’s shallow lagoon is a once-in-a-lifetime opportunity that shouldn’t be missed. Bathe in the warm waters as these gentle creatures glide past you and come and say hello whenever they’re curious. It’s an experience that will stay with you for a long time to come. You can swim with sharks on many of the French Polynesian islands, but Bora Bora was by far my favourite shark encounter. The spot that we stopped at on the boat excursion was deeper than on other islands, but the water was so much clearer. Not only did we see dozens of baby black-tipped sharks, we also saw lemon and tiger sharks up to five meters. It was pretty incredible. Really nice blog and beautiful pictures would love visit few of the places once.